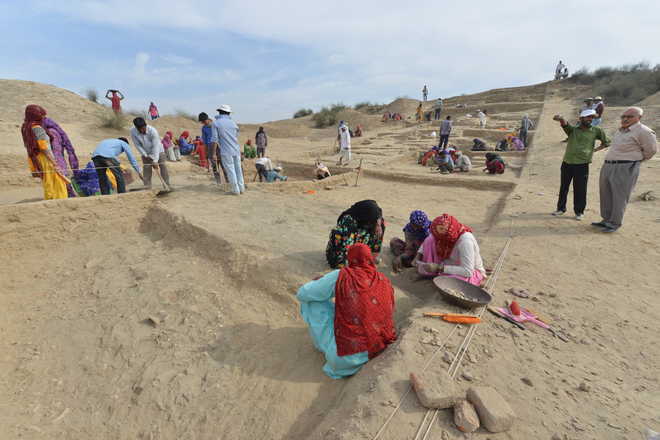 The team of archaeologists revealed that the excavation at this site is all set to change the view that Mohenjo Daro was the capital city of the Indus Valley Civilisation. “Instead, the scientific data collected on the basis excavations here have strongly pointed that Rakhigarhi, a metropolis, was perhaps the capital of its times about 5,000 years ago,” said Prof Vasant Shinde, in charge of the excavation and Vice Chancellor of Deccan College, Pune. Deccan College and the Haryana archaeological department have been jointly carrying out the excavation at the site from last three years. To prove his point, Prof Shinde said this site was spread in over 550 hectares, which is about double than that of the Mohenjo Daro site, which was considered the biggest site till now. “We have collected evidences of massive manufacturing and trade activities in this town, which revealed the economic organisation and the foreign links of people here. They had trade links with people in Rajasthan, Gujarat, Baluchistan and even Afghanistan. The city flourished during the early Harappan era dating back to around 3,300 BC and existed till 2000 BC,” he said. Moreover, the DNA samples collected from the skeletons at the cemetery here are set to crack a major mystery surrounding their lives, character, diseases and race of the people who lived here 5,000 years ago. “Scientists have, for the first time ever, succeeded in extracting DNA from the skeletons of the Indus Valley Civilisation. More skeletons have been found during the ongoing excavation season from mound no.2 for further analysis. Three different institutes of world repute are conducting the DNA analysis for a foolproof study, so that there is no scope of any contradiction,” Prof Shinde said. He said this was the best and most unexplored site related to the Indus Valley Civilisation so far. “So much material is available here that it would take 100 years to complete the study on uninhabited mounds on the outskirts of the village. Health Minister Anil Vij, who visited the site on Saturday, said since Rakhigarhi was turning out to be the biggest and most crucial Harappan site in the world, the state government had decided to set up a museum, research centre and a hostel for the researchers in the village. Interesting. Can't wait for a fuller published report, both of the site and of the ancient DNA. I've left this comment at another blogger whom I follow. But having written it, I feel it concerns you too. It seems to me as if the Lazaridis 2016 paper is just the build up to Harvard's South Central Asia/South Asia paper. They seemed to have taken a brief detour to recalibrate Yamna to use up some Iranian Neolithic, as the other guys (the Lopez abstract) claimed Iranian Neolithic to be significant in the South (Central) Asia region. The fact that Harvard's scrubbed CHG and replaced it with Iran Neolithic, while everyone else is still arguing for CHG in South (Central) Asia, seems to fit with how they know their data of the upcoming region in advance, while the rest don't. So they know what to tweak beforehand. This is my theory: the statistics predicting admixture in South (Central) Asia of Iran Neolithic and the early steppe, rather than the later steppe as was anticipated (by means of Sintashta or Andronovo), may be because the (proto-)BMAC will turn out to already be a match and have to be compensated for. Perhaps the data even shows some BMAC input into Sintashta and Srubna and even Maykop. So by claiming the South (Central) Asia region already had steppe ancestry from the eneolithic or early bronze age, since the Iran Neolithic presence in the region is likely and straightforward in the comparison, (proto-)BMAC will get subsumed under steppe origins and become a steppe culture in entirety too. And after that it won't even matter that the Sintashta or Srubna were partially derived from them, since BMAC would by then have been presented as a part of the steppe horizon since inception. If this all turns out to be the case, I think BMAC will be made the Indo-Iranian urheimat, but it will now have changed hands to being a steppe culture, and therefore be a West-Eurasian culture. It won't really be a win for South Central Asians, as BMAC will be now be rewritten to belong to European origination as much as Sintashta if not more so. Sort of like heads I win tails you lose anyway. They've prepared the case for however it turns out, though the Iranian Neolithic in Yamna seems to indicate they have some inkling of how it will pan out. People like Nirjhar will be "right" but gain nothing from it any way as others will still get credited. Before, BMAC was not IE but "native" and could only be invaded by Sintashta, and now it will be spun the other way if found to have influenced the steppes to its north: BMAC would be steppe not native in origins (and only then does it get to be IE). The insistence lies in the dichotomy that IE cannot belong to the region and must be European euphemized to West-Eurasian. I may well be wrong, but if I turn out to be right then it's purely because it was an artificial foreshadowing, rather than because of the arguments and stats in Lazaridis being used genuinely predictively. Which they can't really be, since the Harvard guys surely must have the South (Central) Asian aDNA already and have analyzed it already too. I hope I'm wrong though. Because otherwise it looks more planned and constructed than like research. Sort of like how CHG was "apparently genetically isolated" in the Jones 2015 paper, whereas in the Lazaridis paper the upper paleolithic Caucasus Hunter Gatherers are shown as an admixture that involves later (neolithic) Iranian genomes. CHG went from a perfect match for admixture into Yamna to not the perfect match, proportional to the rise in prominence of Iran Neolithic's significance in South (Central) Asia, almost as if that was the target and the rest was just to compensate to reach it. If Iran Neolithic had not turned out to be so significant in South (Central) Asia and in Iranian Zoroastrians, Harvard may perhaps not have bothered to replace the CHG in Yamna with Iran Neolithic. It's whatever their target population has that they need to match it with. It shifts with the goal. "BMAC will be now be rewritten to belong to European origination as much as Sintashta if not more so"
jumping the gun. Making BMAC a PIE itself is a massive leap for current academia. Also BMAC dna will differ from yamnaya given the distance.